90° and 18 inches doesn’t sound like a big change but I spent this past Sunday afternoon turning my desk 90 degrees and raising it 18 in. With the goal of improving student access and enhancing movement in my classroom. I used to be a “fortress” teacher. 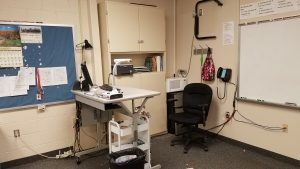 By fortress I mean not only did my teaching style and classroom arrangement reflect a fortress mentality of us versus them, but my desk and classroom arrangement also reflected a bifurcated sense of responsibility. I had one large dreadnought battleship of a teacher’s desk, as is mandatory of all teachers to achieve respect and Authority. I also had a large cruiser class desk for the computer, because as the district insisted, computers were for teacher use only. As a side note, this was not back in the “me generation” 80s or the “Enviro-Nirvana” 90s, this was all the way up through the “Haughty Aughties” (yeah, “aught” like “aught 4 for 1904…I googled and learned something). Since moving to flipped learning in 2012 my teaching has undergone a significant renovation and likewise my classrooms physical arrangement has undergone a significant renovation. The first thing to go was the computer desk replaced by a small little stand, I suppose in keeping with a metaphor, a corvette class stand. The next thing to go was the Dreadnought teacher’s desk. All I had in those drawers was pretty much junk anyway and the stuff that I was saving was stuff I was never going to use again, so it too was banished to the Hallway of Misfit Furniture. For the past few years I’ve been using a single computer table on wheels, to which I have added a little metal stand to hold my pencils, markers, and laser printer. The challenge was the desk still faced the doorway and sat between me and the students. On a positive note, I’ve been blogging long enough that I can’t remember if I have mentioned my student desk arrangement. I have a policy on desk arrangement that reads as follows “ there is no desk arrangement therefore there is no policy”; coincidentally my extra credit policy reads the same. My goal is to wear out the carpet in my classroom by grouping and regrouping desks so often that they finally buy me desks with wheels. The one desk in the room that doesn’t move is mine, and unfortunately I found last week that the desk wasn’t the only thing not moving, I wasn’t moving. My entire class has been moved to a digital slideshow format with all of the learning resources contained in a single link (bit.ly/18-19PRECALC) and I can pull it up on the LCD as needed to show students exactly what they need, where they should be, and how to access it. The problem is that everything is still controlled from that little short desk, so I spend time running back and forth between standing and my chair. I understand I can get a wireless pointer device, but that’s just another thing to sit on my desk when it’s not being used, and therefore something for me to run back to my desk to get. The bigger issue that I have is that I would get trapped in my chair behind my desk by students asking questions, attending to computer tasks, or any other number of housekeeping items. The solution, I believe, was to turn my desk 90 degrees and raise it 18in. My desk is now a standing desk thanks to Ace Hardware. My computer is no longer a fortress wall but is instead tucked over against the brick wall at one end of the desk with my document camera at the far end where it can still be used as I, or students, stand and teach or lead group activity. Students no longer have to come and squat or bend over my desk if coming up to ask questions. I am also more mobile when taking care of those mandatory housekeeping items, meaning there should be less opportunity for them to be at my desk. However, I think the biggest change is the initial student impression. While I can’t face the wall for any length of time for classroom management purposes, given some of the classes that I teach. By placing the desk where I have, it is now simply a work peninsula that no longer sits between me and the students. When the students come to the door they no longer see the front of my desk but they see a large clean open work area where the teacher may be located but it’s not separating me from the students. This arrangement also opens up another precious few feet of wall space to replace a current bulletin board with another whiteboard for student work. The goal is giving both a first impression and a continual impression of my classroom that nothing separates the duties or responsibilities for learning in this classroom. We are all here to be part of the process, and I now hope that my personal space in the classroom is a better indication of my teaching philosophy that this classroom is a shared space meant for sharing.